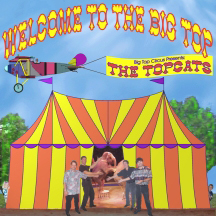 On June 29th, 2002 The Topcats released their latest CD, “Welcome To The Big Top”, the long awaited follow-up to “Party With The Big Dogs”! Almost two years in the making, “Welcome To The Big Top” follows the same format as “Party With The Big Dogs” with fourteen cover tunes recorded live and a number of new original tunes, including “Follow You Down”, which is receiving air play on WCKW 92.3FM The Point in New Orleans. The band originally recorded some live material at The Bengal in November of 1999, but due to a lack of time and energy, these recordings never made it to disk. As time went by, the band decided to record again to capture some of their newly learned material, which they did again at The Bengal in December of 2001! The guys then went into The Apartment Studio in May of 2002 where they recorded the original songs and mixed and mastered the complete project. 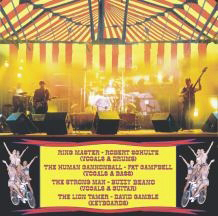 Produced by Buzzy Langford, with graphic design by David Gamble, “Welcome To The Big Top” features Robert as the “Ring Master”, Buzzy as the “Strong Man”, Pat as the “Human Cannonball”, and David as the “Lion Tamer”. The CD starts with “Balloonograph”, as circus intro sequenced and recorded by David, and continues on with “Welcome To The Big Top”, a little ditty written by Buzzy. An introduction to the “live” portion of the disk by the Big Top M.C., Jason Olivier, is followed by “Centerfold”, “Jessie’s Girl”, “Keep Your Hands To Yourself”, “Let’s Get It On”, “The Freeze”, “Boogie Shoes”, “Brown Eyed Girl”, “Sweet Soul Music”, “The Electric Slide”, “Wild, Wild West”, “Bad Day”, “Shake It Like A Dog”, “Back That Azz Up”, and “What I Like About You”. 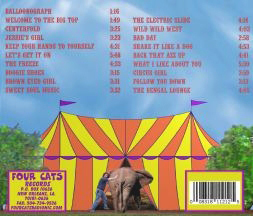 The disk concludes with “Circus Girl” and “Follow You Down”, written by Buzzy and “The Bengal Lounge”, written by Carlo Nuccio, with additional lyrics by Buzzy. Check out the songs below. “Balloonograph” shows the circus side of the disk. “Boogie Shoes” and “Brown Eyed Girl” show the party side of the disk, and Follow You Down shows the original side of the disk!